Four of you entered and three of you got all the questions correct except one! I had to use a random number generator to determine the winner! 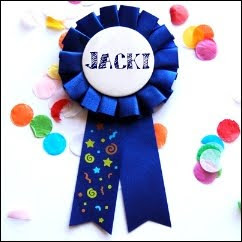 And the winner is.... Jacki from Keeping up with me! Congratulations Jacki! Please email me your address to: tunaymahal8279ATyahooDOTcom so I can ship your prizes to you! 6. My favorite drink at Starbucks is? White Chocolate Mocha.